The painting I have chosen here is called Indians Fishing by John White. It is one of a group of paintings produced in the failed colony of Roanoke, Virginia, and therefore one of the first pieces of art from the Americas by a European. I discuss this and another John White painting in chapter five of American Art: Volume I. I have geared these questions for kids 8-13, but the great thing about this game is you can easily gear the questions to younger or older students. Sometimes I let the students take turns asking the questions. How many boats are in the water? Name three things that are in the canoe. Two men are standing in the water. What are they holding? Is there land on the horizon? What is written in the sky? The manner of their fishing. 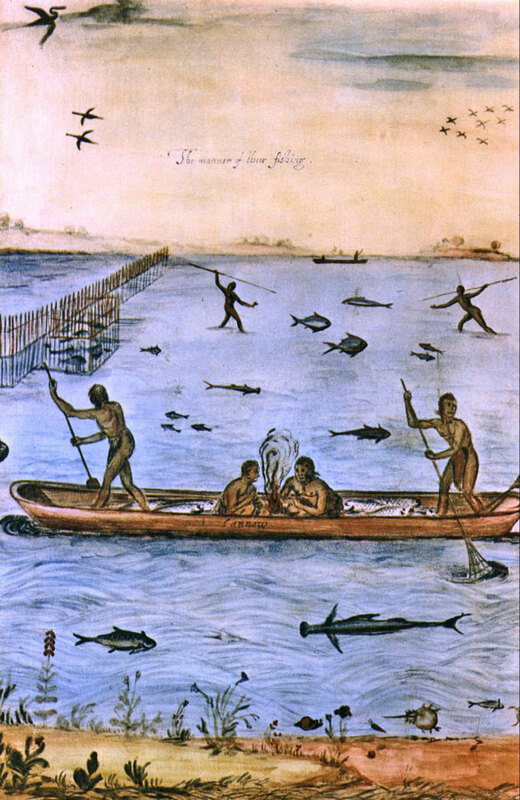 The manner of the indians fishing. How is canoe spelled in the painting? How many birds are in the flock? Which of the following animals is not in the painting?